Cody Wagner loves to sing, mime (not really), and create. He writes about topics ranging from superpowers to literate trees (really). The sequel to his award-winning novel, The Gay Teen’s Guide to Defeating a Siren, recently “came out.” See what he did there? Cody dealt with bullying as a teen and wanted to provide a fun escape for all the underdogs out there. He’s also handing out cookie dough to everyone who grabs a copy. Check out his writing and see more of his wackiness at www.wagner-writer.com or find him on Twitter @cfjwagner, Goodreads at www.goodreads.com/wagner_writer, and Amazon at www.amazon.com/Cody-Wagner/e/B016NYGV40. 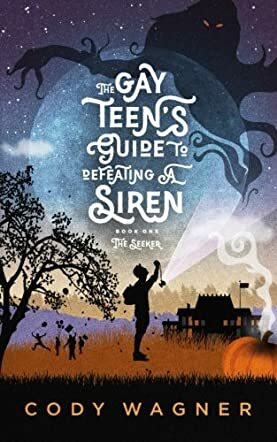 The Gay Teen's Guide to Defeating a Siren is book one of the Seeker series by Cody F. Wagner, and an interesting mix of fantasy, boarding school drama, and gay coming of age story. Blaze Trales, who gets to hear plenty of jokes about his name, accidentally outed himself in front of his parents. Fortunately, they have just received a flyer about a boarding school that would help to "pray the gay away." Blaze is not happy, but once he arrives at the school, he finds it different from what he expected. He lives in a dorm with another gay boy and one girl. They quickly become friends of sorts, and soon Blaze finds out that the school is not what the parents who sent their kids there to be "healed" would expect. And the school has an ancient enemy. A siren. The Gay Teen's Guide to Defeating a Siren by Cody F. Wagner is a good introduction to the Seeker series and gains momentum with every chapter. The book has a lot of humour. While it is aimed at young adults, especially gay teenagers who still have issues with being gay, it is a great book for readers of all ages. I wasn't quite expecting the story to turn into something so interesting and exciting. The more you read, the harder it is to stop reading, and you get one or the other surprise, especially towards the end. At the end, things definitely did NOT go the way I thought they would go at all. Cody F. Wagner's writing has a fresh feel to it, the characters are well written, and at the end you're left wanting more.